Here below you will find Security jobs list in Southern Suburbs. All job ads are for those who are looking for Security jobs in Southern Suburbs. If you want to see job ads in other job category or city, please refine your search. Exciting Security Career Prospects All Over South Africa. Security jobs in South Africa can make superb career paths for people for many reasons. There are many diverse security positions available to job seekers. They can look for positions as guards, surveillance operators, investigators, security managers and CCTV operator professionals. There are plentiful security guard training courses available to people who want to pursue careers in the extensive field, too. If you're searching for specialised training options that may be able to help you land a coveted security position in South Africa, there are quite a few choices in front of you. Job seekers can learn about vital subjects such as close quarter survival, advanced driving and close protection. Security guards in South Africa can seek employment in a broad assortment of work settings. Security business are growing. Let's work in Security sector! High Crimes rate in South Africa motivates to work at Security sector What salary can you expect as a security guard in SA? 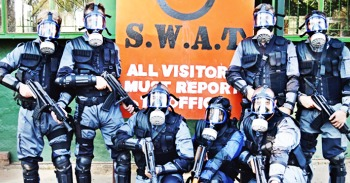 Growing private security industry in South Africa PSiRA registration. Who must register? You see Security jobs list in Southern Suburbs. If you can't find job here, please choose another job category or city.